Pack The Boards And Travel! The Winterial double snowboard bag allows you to travel with a friend and pack ALL your snowboard gear in ONE bag. 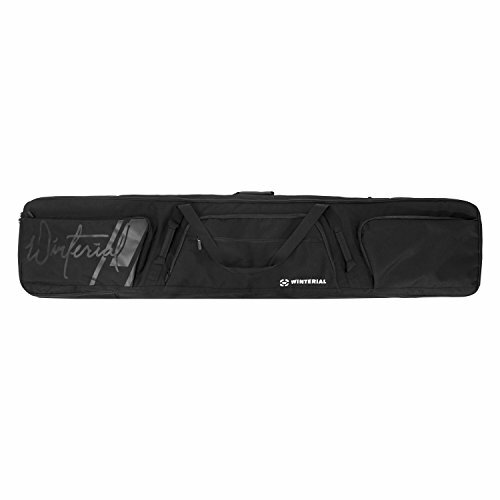 This snowboard bag is constructed with the traveling snowboarder in mind! Our team knows the difficulty of traveling through the airports or to the mountain, and we solved that problem. A snowboard divider included will separate your board from your friends while still allowing space for other gear. - Double stitched handles for extra durability with a fully loaded bag! - Padded board compartments for extra protection! This bag is built to be thrown, stacked on and scratched. A layer of padding that surrounds the snowboard bag was built for air travel. Now grab your board and a friend and head to the mountain. DIMENSIONS: 64in x 11.5in and very roomy for multiple boards and other gear! WATERPROOF: Inner lining waterproof bag that allows you to stack boards on top of each other. This will trap any left over snow inside. WHEELS: Roll your bag through the airport and on your way to the mountain. Pack 1 bag, pay for 1 bag and get on the plane! BUILT FOR AIR TRAVEL: Padded layer around the perimeter of the bag prevents damage while transporting. This was built for stacking and being thrown around in the under carriage of the plane! DURABLE: Strong zippers and well constructed nylon handles make this double snowboard bag the ultimate travel bag!